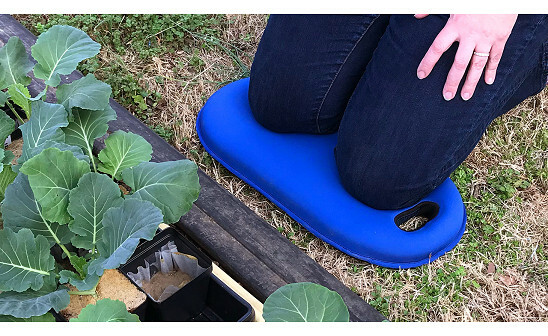 This pair of garden knee pads makes time spent working in the yard more comfortable. The pads provide soft cushioning while you're on your knees digging and weeding, or even doing jobs around the house. They're made from durable and waterproof neoprene and have adjustable straps to get the just-right fit. These are nice &a cushiony, but unfortunately I will have to return them because they are a little tight around my knees. Do u have any sizes that go around the knee with a little extra stretch. Fit great, don't loose they're elastic. They really do the trick and they feel great on! Nice and well-made. I use them more to protect mu shins when on a ladder. Nice that these are adjustable size-wise with velcro straps. The folks at BosmereUSA are committed to bringing gardeners the very best gear to make their time spent outside as enjoyable (and productive) as possible. And their garden kneelers and knee pads fit the weeding, digging, and planting bill. The cushioned, lightweight pads keep you feeling comfortable while you’re hard at work in the garden or even inside your home. They're made from a lightweight, memory foam cushion that's wrapped in a quick-drying neoprene cover that is waterproof and easy to clean. And, though the pads were made to be used out in the garden, they’re just as handy for jobs indoors that can be hard on your knees, too, like cleaning the tub.